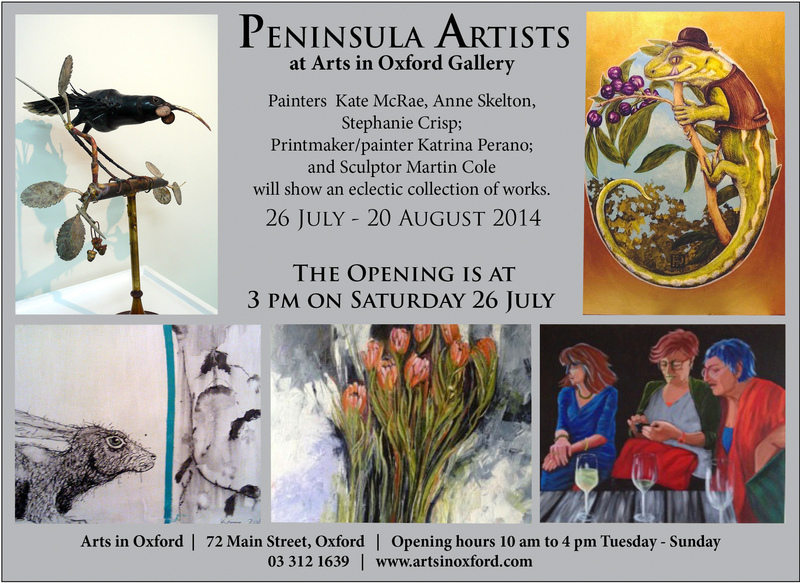 During July/August, we are hosting a group exhibition by five artists from Banks Peninsula. Painters Kate McRae, Anne Skelton and Stephanie Crisp, Printmaker/painter Katrina Perano and Sculptor Martin Cole will show a collection of works of a variety of sources and styles. Kate McRae’s series In the Night Garden forms the third phase of her post-earthquake work, focusing on the idea of regeneration, and nature fighting back. The paintings are conceived as drawings of imaginary walls with paintings executed on them, in a primarily monochrome palette. Anne Skelton is familiar to us for the jewellery and painted plaques produced via her collaborative project of wearable arts, but here she is introducing us to another talent by exhibiting a series of portraits in acrylic. Stephanie Crisp’s work has been shown at the gallery frequently, but here she also will be showing work that is very different to what we have seen before. Katrina Perano likes to make up little stories within each painting, portraying the personalities of the native creatures, using humour and elements from New Zealand’s fascinating past. Martin Cole is fascinated by the process of assemblage – ‘it’s all about the bits and bobs’. Martin’s sculptures are also inspired by the shapes and qualities of the scrap and objects that he works with, how the thick and thin metals work together in the welding process, and how the accumulation of patina develops.